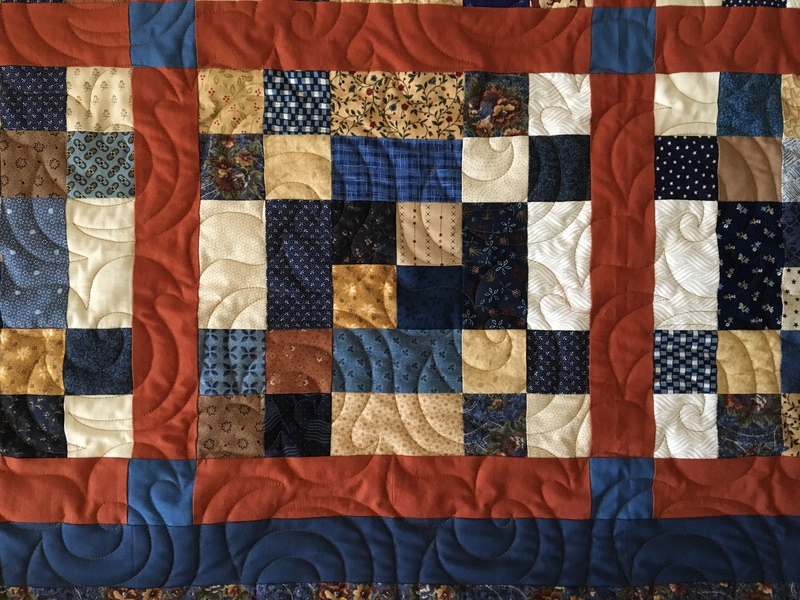 Have you ever admired a friend’s quilt and determined to make one “just like it”? I loved the simple yet effective design, so I made several blocks with leftover 2 1/2” wide strips. Although I also used scraps, the fabric placement in my blocks is planned rather than left to chance. I have enough coordinating strips to make two more blocks and perhaps a pieced border of squares. So much for making a quilt “just like” Patti’s! 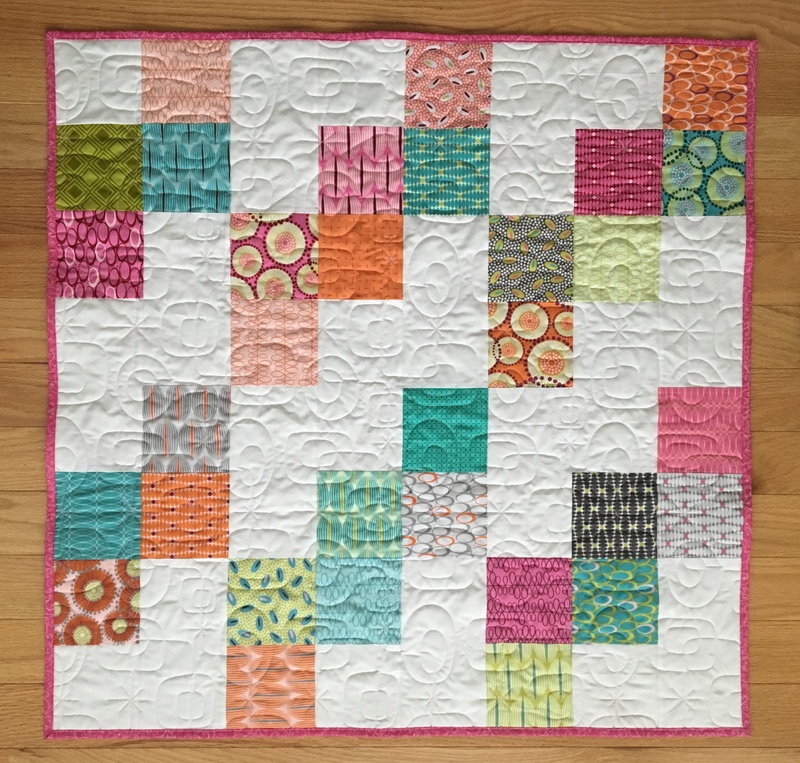 Have you ever used a quilt design as a springboard for your own creation? My apologies for not announcing the winner of the March/April Pre-cut Patchwork magazine a week ago as planned. The winner is Bonnie H., and her copy of this inspiring issue is in the mail. In response to my question, “What is your favorite pre-cut to collect and use?,” I received some enlightening and humorous comments. Jennifer J. wrote, “As for pre-cuts, my stash is small! I have purchased 3 jelly rolls, 1 charm pack and zero layer cakes. I look at the Missouri Star Quilt Company sale everyday waiting for the perfect layer cake to catch my eye. I want to buy one just because I want one! Thus far I have only used a jelly roll, so that is my favorite pre-cut! Thanks to all who left comments. And I admit I laughed aloud at Beth’s and Kathryn’s comments! I’ll contact them to chat about stash enhancing pre-cuts I can send them as a reward for their humor. 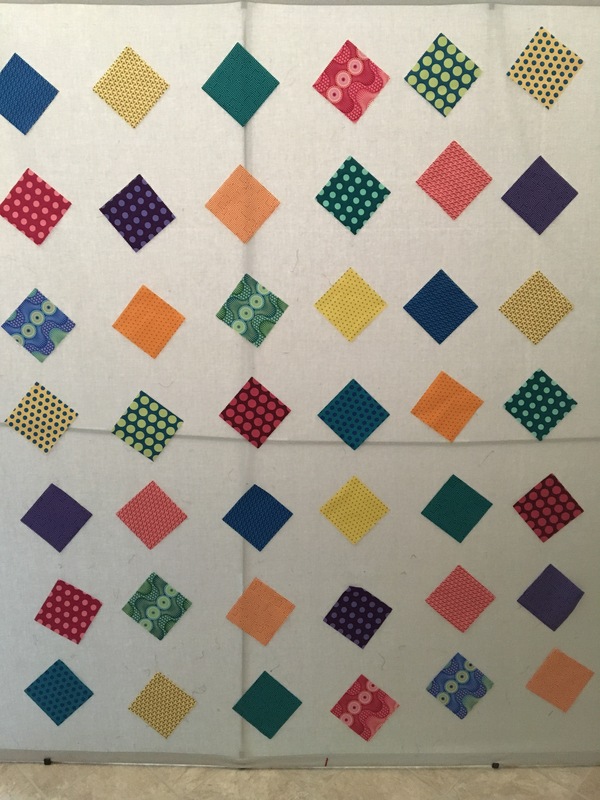 Heather’s blocks from 1930’s repro prints will make a special welcome quilt for a new baby. Pam’s lovely lavender fabrics will herald spring as a table topper. Edwina plans to make several more blocks for a Quilt of Valor. Great fun was had by all participants as they learned an efficient way to cut and sew fat quarters! On Wednesday Pam drove her daughter and me to Hamilton, MO, home of Missouri Star Quilt Company. We did not see Jenny Doan, of you tube tutorial fame, but we did shop in about eight fabric venues housed in refurbished store fronts. Of course I purchased some yardage and several packaged pre-cuts as souvenirs! 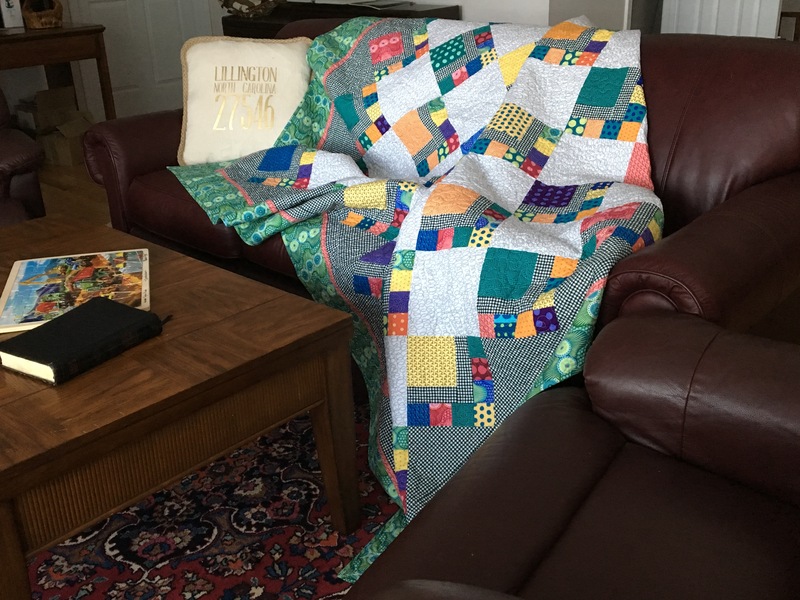 Blogger Katy came to my rescue when she posted pictures of a baby quilt she made for a Habitat for Humanity auction. 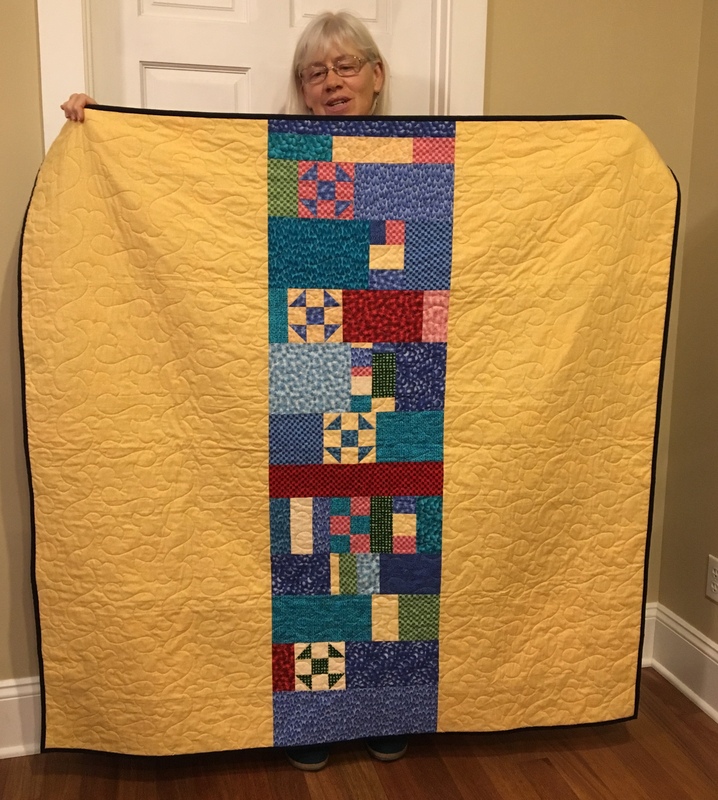 Click here to see her quilt. The discerning among you will point out that my design is not exactly like Katy’s, but her quilt was my inspiration. 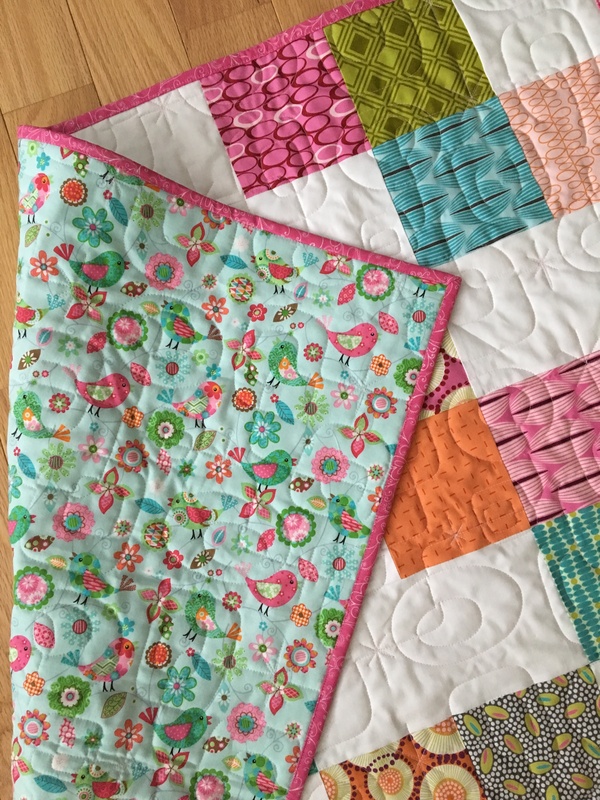 By adding white 5″ x 9 1/2″ rectangles and 5″ squares, I was able to stretch my partial charm pack into a fun quilt for a baby girl. In my stash I found a perky bird print in just the right colors to back the quilt. I added interest to all the “negative space” (white areas) by quilting a “Modern Squares” pantograph in light pink thread. A whimsical bright pink fabric for binding finishes the quilt perfectly. What ideas do you have for using partial packages of pre-cuts? Please share your tips in a comment below. I have another pretty quilt on my sofa. Unfortunately, it is not mine, so I can’t keep it. It was pieced by Kathy P. as a result of a workshop I taught for her guild in Trenton, KY in early January. 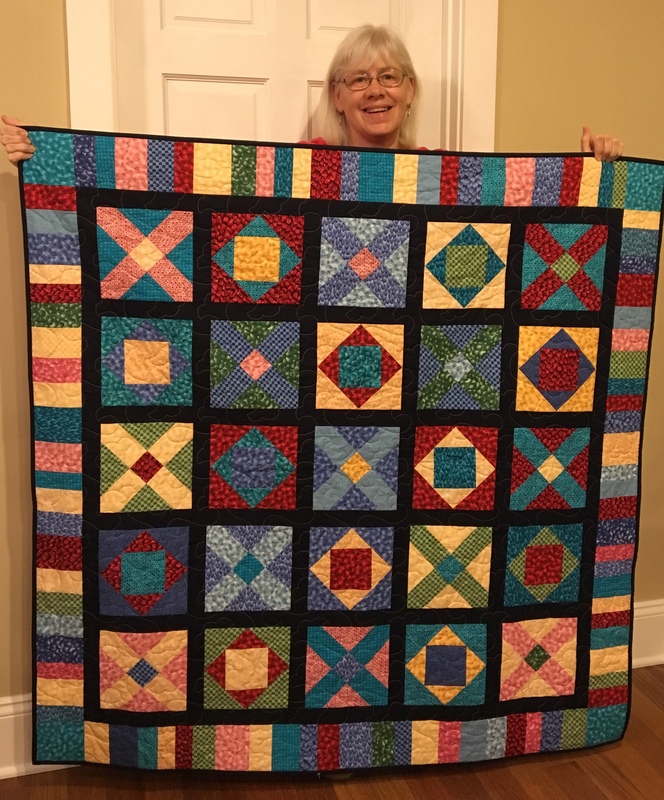 I am so proud of Kathy and her friends; many have already finished their quilts (or at least the quilt tops). Kathy chose a tan thread a bit darker than the off-white background fabric. Choosing a shade darker allows the quilting texture to show up nicely on both the background and the blue fabrics. 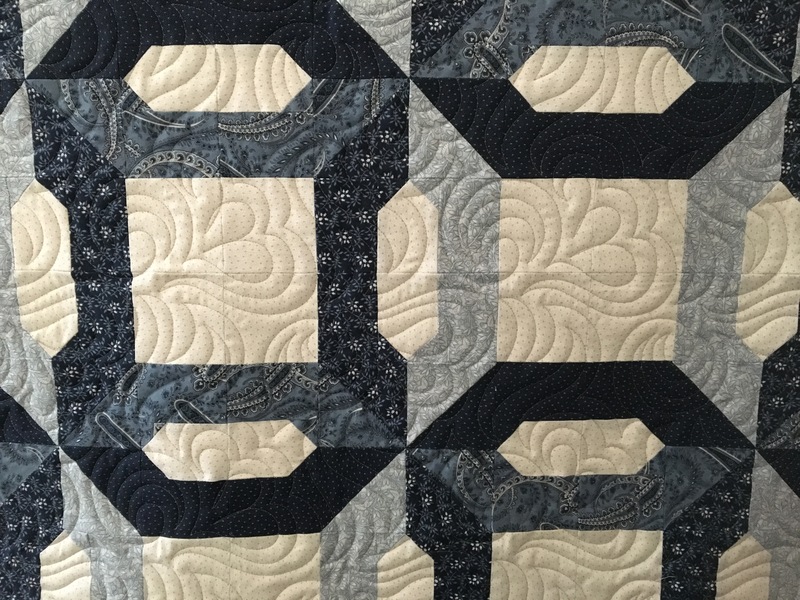 For quilting, Kathy wanted an edge to edge design with curves. We settled on “Calliope,” a new one in my arsenal of pantographs. In my opinion, this design adds curvy elegance to the angular patchwork. Kathy plans to face the quilt rather than bind it. 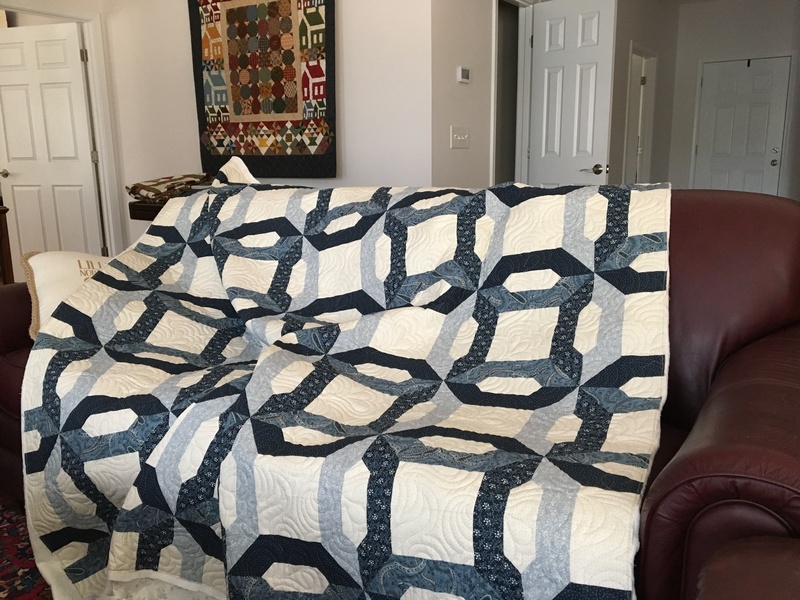 Click here for a very helpful tutorial for this method of finishing a quilt written by Susan Brubaker Knapp, http://www.bluemoonriver.com. “Linked” was published in Quilts from Quiltmaker’s 100 Blocks, Fall 2017. 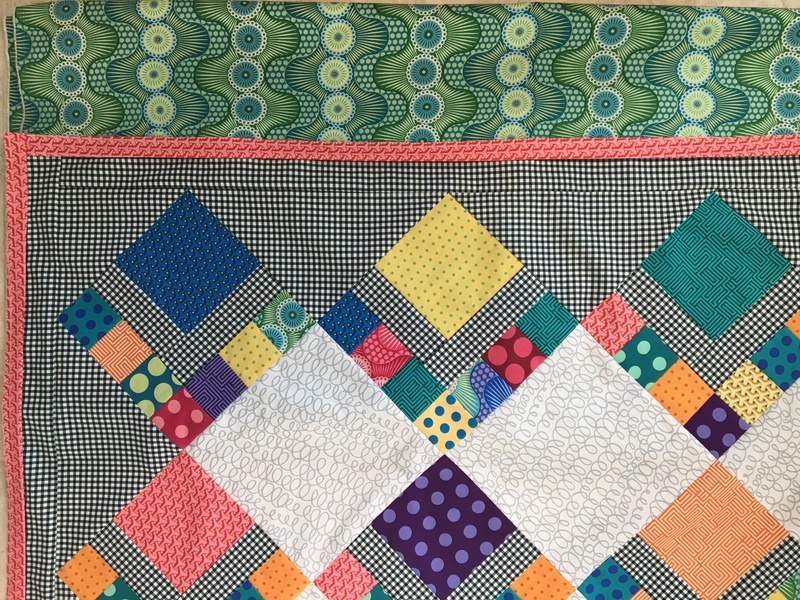 My idea in designing the block and the quilt was to mimic a “Double Wedding Ring” quilt using rectangles and triangles, thereby avoiding piecing the curves of this traditional pattern. Read more about my quilt here. When I met up with my friend Marie at a quilting retreat in late February, she had a quilt to show me. Marie used my pattern “Buttons for Betty” that I developed as an efficient way to use a Layer Cake (i.e. a stack of 10″ squares). 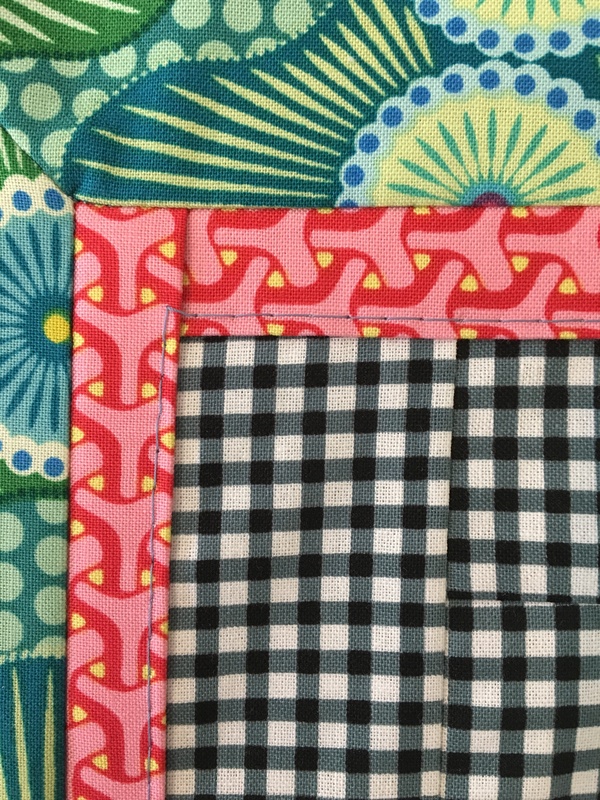 You can see that the blocks alternate between a “Square in a Square in a Square” and an “X Block.” The method: Choose three 10″ squares of contrasting colors, carefully stack them one on top of the other, cut through all three layers according to the instructions, swap the fabrics so that the design appears, sew each of the three blocks together. 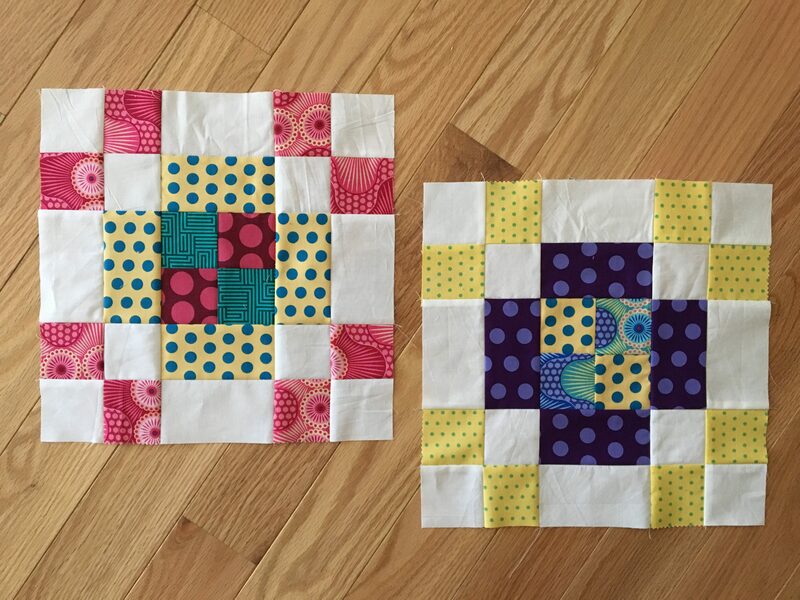 Therefore, you cut for one block, but you get three blocks because you stacked the three fabric 10″ squares to begin with. Marie’s fabrics: Years ago, when stationed in Germany, Marie ordered a bundle of fat quarters online. She hasn’t used them until recently because while there were several different colors and prints, each colorway had the same prints. She had hoped for more variety in prints/textures. 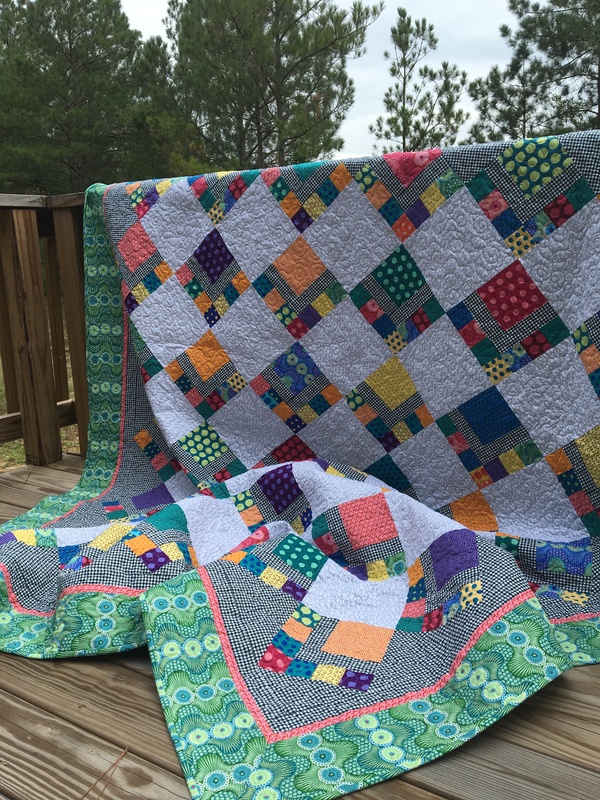 Marie found that “Buttons for Betty” was a great way to use this languishing bundle; she cut two 10″ squares from each fat quarter and used the leftovers for a Piano Key border and for a pieced backing. The back of Marie’s quilt is just as interesting as the front! I love the four little “Shoo Fly” blocks interspersed with the fabric scraps. Have you seen the March/April issue of Pre-cut Patchwork magazine? It includes so many fun projects which can be quickly constructed because half the cutting has already been done for you. 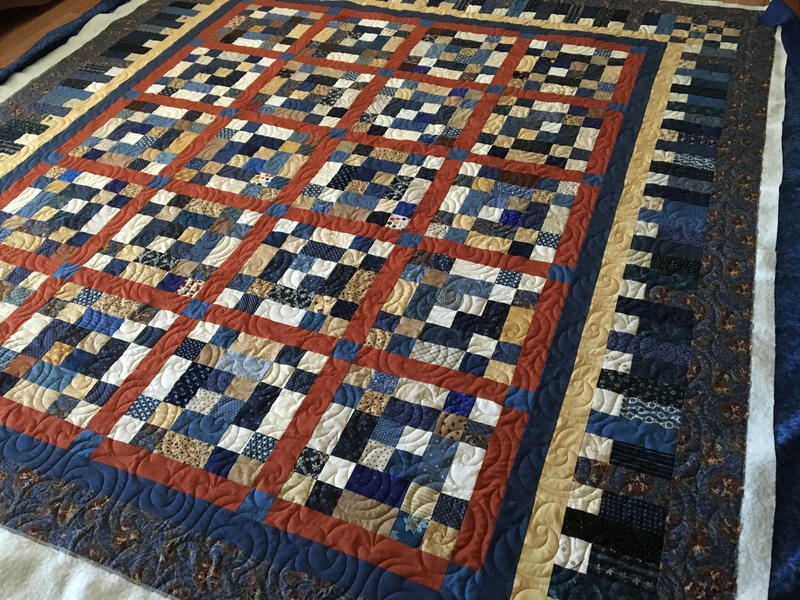 That’s the beauty of using pre-cuts like 5″ squares, 2 1/2″ wide strips, and 10″ squares. My quilt, “Around the Corner,” is pictured on page 10. 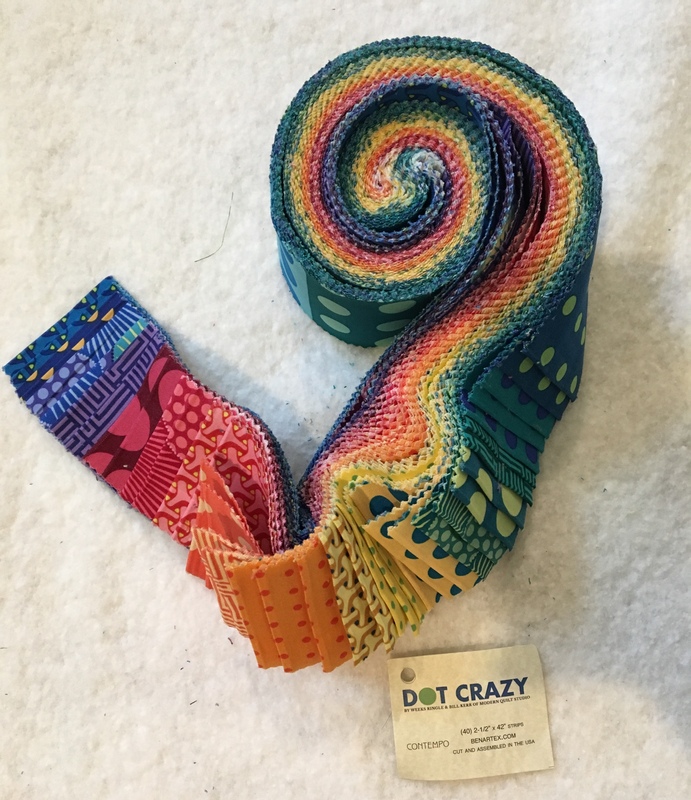 The pre-cuts I used were a package of 5″ squares and a roll of 2 1/2″ strips from the “Dot Crazy” line by Benartex. The overall design includes popular fabric elements: bright textured prints, a fun gray print for alternate squares, and black and white check for patchwork, setting triangles and inner border. I first placed the 5″ squares on my design wall, spreading colors and textures evenly throughout. Taking a picture of the arrangement at this juncture was crucial in keeping the blocks in order. 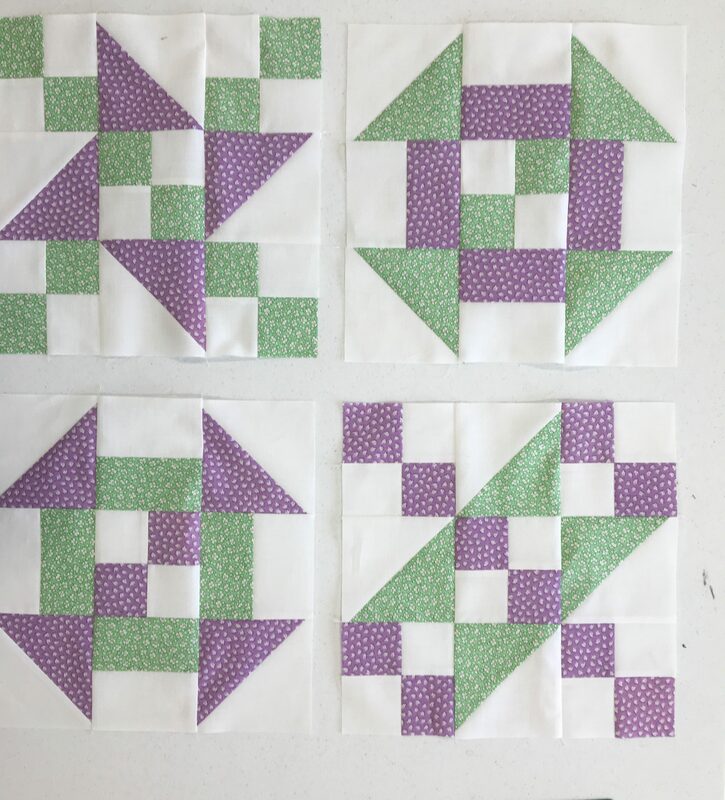 After I made the blocks, I joined them in diagonal rows alternating with squiggly gray print squares, beginning and ending each row with a black and white check triangle. I added a narrow flange of red print between the inner border of black and white check and the outer green print border. Here’s a tip that will make your longarm quilter happy: hand or machine baste the edge of the flange so that the machine’s hopping foot won’t be caught under the flap. Zoom in to see my basting with blue thread. The basting can be easily removed with a seam ripper after the quilting is complete. This was a quick and easy quilt to make and looks quite perky on the back of my maroon sofa. The intense colors brighten my living room considerably. If you need a gift for a graduate or bride, consider making “Around the Corner.” I’d love to see your rendition of the design. 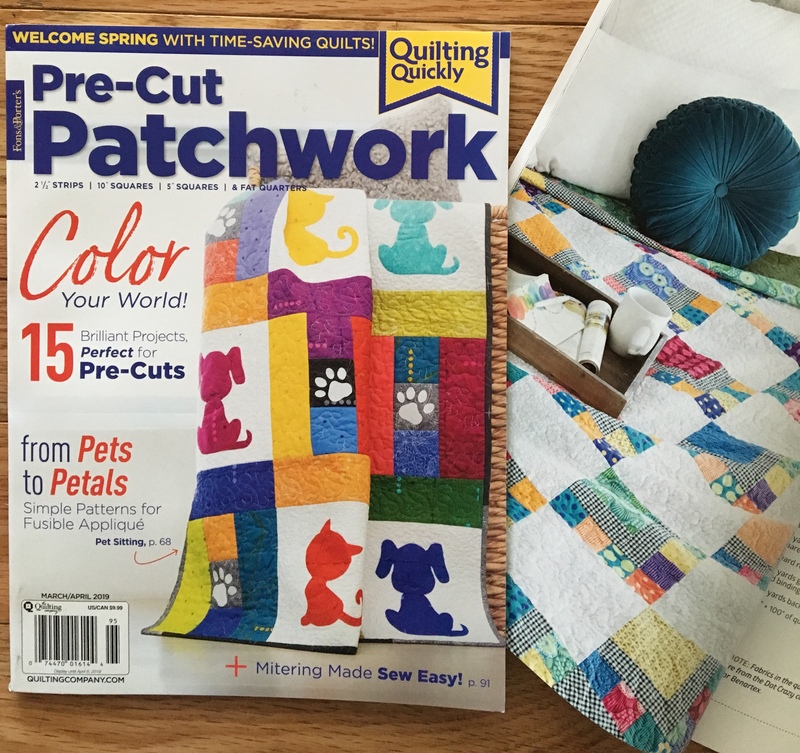 The editors graciously sent me several copies of the March/April issue of Pre-cut Patchwork to offer blog readers. Please comment below to be entered into the drawing on April 5. In your comment, tell me your favorite pre-cut: 2 1/2″ strips, 5″ squares, 10″ squares, fat quarters. Remember that I often reward the comment I find humorous or interesting!